In the conditions of continuing foreign policy instability, the problem of ensuring economic security at the national and régional levels is steadily increasing. The existing methodologies for assessing the security status of regional economies are static. Furthermore, they include a scattered list of indicators that are difficult to consistently interpret when conducting an analysis. Therefore, the authors proposed an indicative dynamic method for assessing changes in the security situation of the regional economy. As the initial data we have used indicators of the development of the Sverdlovsk region for the period from 2010 to 2017 inclusive. We have achieved the following results. Firstly, we have suggested the set of the indicators, which result in changes in the level of economic security of the region. 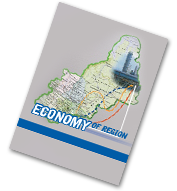 Moreover, we have structured the main factors that have a formative and destructive impact on the economy of the region. Secondly, the conducted analysis has shown that the economic development of the Sverdlovsk region can be divided into two main phases: upward (2014) and downward (from 2014 to the present). This is a consequence of the instability of the regional economy to external shocks due to weak diversification as well as low entrepreneurial activity. Thirdly, the growing threats to the economy of the Sverdlovsk region lead to a decrease in the welfare of the population. In 2015, the level of wages in Moscow was 2 times higher than in the Sverdlovsk region, however, by the end of 2017, the level of wages in Moscow was already 2,2 times higher than in the Sverdlovsk region. At the same time, in Moscow, St. Petersburg and Tyumen, the growth rate of income of the population was about 10-11 % for 2017, while, in the Sverdlovsk region the income growth for the same period was only 5 %. The obtained results can contribute to the development of the Sverdlovsk region strategic programs aimed at ensuring the sustainable socio-economic development of the region. The findings concerning the level of economic security in the Sverdlovsk region are not final. This means the need for further development of economic and mathematical models that will logically complement the methods proposed in this article for assessing the economic security of Russian regions.